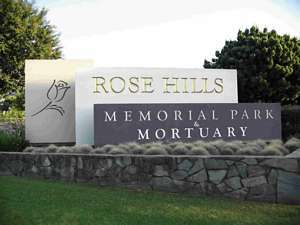 Located in Whittier, Rose Hills Memorial Park has provided cemetery property and funeral services since 1914. It is larger than any other memorial park in the country. Notable persons memorialized here include public educator Jaime Escalante, former South Vietnamese President Duong Van Minh, renowned choreographer Alvin Ailey, rapper Eazy-E and former California governor Goodwin Knight. Click here to visit the Rose Hills Memorial Park website. Click here to search for obituaries and grave sites on the Rose Hills Memorial Park website.